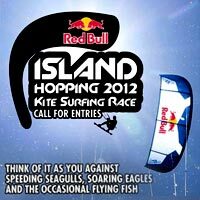 1.1 The Red Bull Island Hopping 2012 will be held from 07.07.2012 to 08.07.2012. The competition has no separate men and women divisions. 1.4 In case of no wind there will be no prize money. 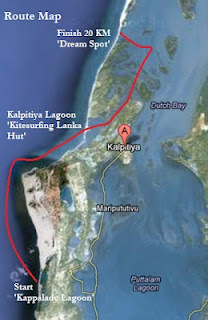 2.1 The race event will be organised by the Kitesurfing Lanka (Pvt) Limited and KTA for and on behalf of Red Bull Sri Lanka. 4.1.4 No National Authority prescriptions will apply. 4.1.5 The WSSRC Rules on WSSRC supervised events. 4.3 If there is a conflict between languages, the English text will take precedence. 8.1 Competitors may be required to carry advertising for event sponsors – both on their kiteboards, and on a lycra vest if supplied by the organiser. 9.1 It is the responsibility of each competitor to ensure that his/her board and equipment conforms to its Class Rules. 9.2 Only standard Twin Tip boards with no adjustable parts and a maximum size of 6cm fins are allowed. 9.4 Competitors shall bring their own equipment. 10.1 Every competitor is required to wear the official event lycra with his personal identification number whenever competing or required by the event organisers for promotional purposes. 11.1 If personal buoyancy is prescribed every competitor and support boat crewmember shall wear, above the waist, a jacket harness or vest with a minimum buoyancy of 4kg un-inflated in fresh water. The buoyancy shall be tested with a ferrous metal weight of 4kg, which shall remain supported for a minimum of 5 minutes. 11.2 Personal buoyancy is advised for all competitors under 17 years of age. 13.2 Alterations to the SIs shall be approved by the Class Representative. 14.1 The course will be downwind race with checkpoint at Kalpitiya lagoon. 15.1 Winner is the first to finish the race on a correct course. 16.1 Support boats and safety craft shall be clearly identified. 17.1 Medals or trophies and prize money shall be awarded to the first three competitors of the kite race and to the winner in hang time and upwind challenge. 18.1 Competitors take part in all races at their own risk. The LOA, IKA, ISAF or any of their officials or representatives or the sponsors or their officials or representatives are not responsible, under any circumstances, for any damage, loss or injury either ashore or on the water either to persons or equipment, which may result. 18.2 Participation in this event, supporting events and in each race in them is at the sole discretion of the sailor and at his/her own risk. Notice is drawn to RRS 4. 19.1 Competitors shall possess valid third party liability insurance with a minimum cover of 1 million Euros. 19.2 Coach and support boat drivers shall also have valid third party liability insurance. 21.1 Attendance at the Opening Ceremony, Prize Giving and Closing Ceremony is mandatory. 21.2 The organiser reserves the right to refuse entry to those whose standard of attire is not commensurate with the occasion. 22.1 Competitors are reminded of the ISAF rules and regulations concerning the use of banned methods and substances. Drug testing may take place during the event.